According to various outlets, confirmed by the team, the Penguins have signed former St. Louis Blues, Florida Panthers, Ottawa Senators, and Montreal Canadiens coach Jacques Martin to an undisclosed deal to join Dan Bylsma, Tony Granato, and Todd Reirden behind the bench. Martin led his various teams to the playoffs 12 of his 17 years as a head coach. While he never reached the Stanley Cup Finals he led his squads to the Conference Finals twice in his tenure. 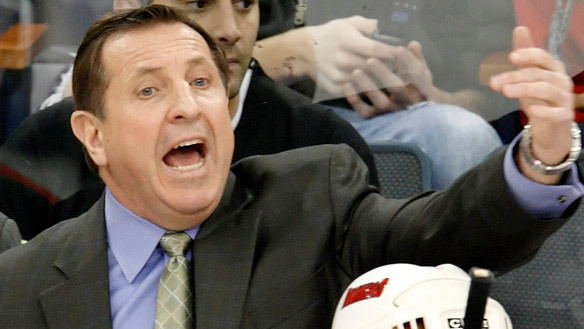 He's one of nine NHL coaches to reach the 600 win mark with a career record of 613-481-119-81. Known largely for his defensive style, including a smothering trapping style, Martin has the ability to squeeze every ounce of ability from his defensive corps. Though fired during the 2011-12 season by the Canadiens after a lackluster start, Martin led the Habs to an Eastern Conference Finals birth by downing the Penguins, stifling the Penguins attack and relying on Jaroslav Halak to make the easy saves. Martin can also be a large help as a third voice in the room for Bylsma. After Bylsma acknowledged he's "still learning" in a season ending press conference, Martin is another experienced head coaching voice behind the bench along with Tony Granato. His experience running a trapping style of game can also come in handy on game day. The off season coaching hunt is not over for the Penguins. With Gilles Meloche stepping down earlier in the off season as goaltending coach the Penguins continue to search for someone to coach a goaltending pool that grows deeper every season and as questions of Marc-Andre Fleury continue to grow. As always stay with PensInitiative.com for updates, news, and views during the 2013 NHL off season.